Widely used in hospitality, healthcare, and commercial buildings, smart glass is finally reaching to private houses. If you haven’t heard of it yet, the fancy thing about a smart glass is that it becomes completely translucent or transparent by your demand. Now, you probably wonder, how does smart glass work? Once again, what is a smart glass? Smart glass, also known as switchable glass or electronically tintable glass, is a type of glass or glaze that, under a certain voltage, heat or light, changes its transparency properties, becoming completely opaque or transparent. The main advantage of smart glass for private homes is its cost-efficiency. When installed in the house, smart glass makes it climate-adaptive, decreasing your expenses on heating, air-conditioning, and electricity (lighting). Moreover, with smart glass, you won’t need to spend money and time searching for a perfectly suited to your interior curtains and blinds. Last but not least, smart glass is an instant solution for creating privacy in certain parts of your home, for instance, in your bathroom. It can also be used for a more efficient use of small home spaces. Despite its cost-efficiency, the initial installation of smart windows is still a luxury. 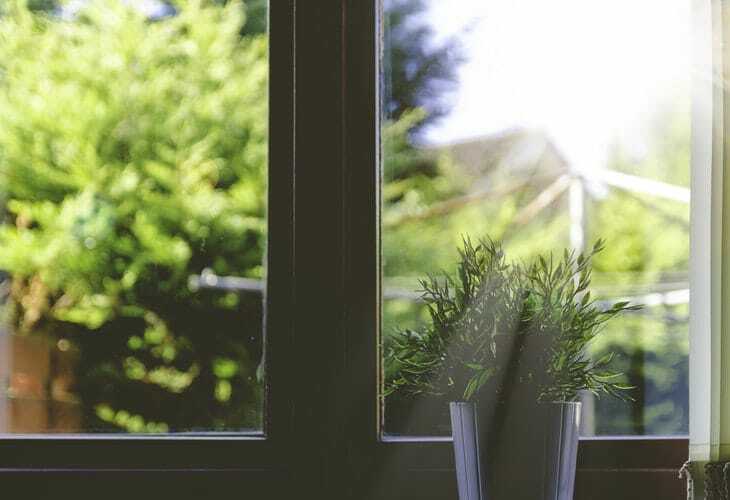 However, while you are waiting for the upcoming drop in price for switchable glass, you can start with other more affordable options for windows’ automation. Smart glass can be based on electrochromic, photochromic, thermochromic, liquid crystal or other modern technologies. The decision of what type of smart glass to purchase for your home depends mainly on the usage and location of the glass installation. For example, if you want to separate your bathroom from the master bedroom with a smart glass to create privacy, you should most probably use liquid crystal smart glass. Smart glass based on liquid crystal switches from translucent to transparent state the most quickly of all (in milliseconds) while its tint alterations show up consistently regardless of a panel size. Liquid crystal switchable glass is the most opaque type when in its translucent state, however, it does not offer a shading benefit. An electrochromic smart glass is the best solution in case you were thinking of having switchable windows in your house. This type of glass works in a completely different way comparing to a liquid crystal based one. The changes of electrochromic smart glass are less quick and consistent throughout the panel and there is no absolute translucent or transparent states. However, electrochromic smart glass is able to create varying levels of light penetration, allowing a complete adaptability to sun levels. Finally, how does smart glass work? Now, when you understand that switchable windows are a must-have addition to your smart home, it’s time to find out how does smart glass work. Regardless the technology on which your smart glass is built on, they all use the same logic. It is never glass itself that changes its transparency properties. Most switchable glass panels consist of two separate glass layers and a layer of a special material in-between, which can change color when energized by an electrical current. Essentially, the electric current passed through this sort of material creates a chemical reaction, changing the properties of the material. In this case, it alters the way the material reflects and absorbs light, making the glass installation completely colored or see-through.